Of all the literary adaptations reaching our screens this year, none is as seemingly impossible – and yet, simultaneously, rife with possibilities – as Spike Jonze’s long-awaited realization of “Where the Wild Things Are.” A work that occupies multiple positions within the popular culture pantheon – grade-school standard, highbrow literary classic, cult hipster item, fine-arts touchstone, pop psychology standby – it arguably nourishes a broader audience than any children’s text published since. As such, Jonze’s film has been complicated throughout by shifting lenses of expectation: as a family film perhaps more eagerly awaited by parents than their children, as a mainstream entertainment aiming to appease art house mavens and indie kids, it is essentially required, like its literary source, to be all things to all people. His own artistry notwithstanding, Sendak achieved such catholic appeal through the sparseness of his approach. With a narrative of fewer than 400 words – not even half the length of this very article – “Where the Wild Things Are” is an exceptionally porous feat of storytelling that accommodates a wide range of interpretations and identifications from the reader. It is plainly a metaphor-driven story, yet there isn’t enough text to articulate or prescribe the symbolism that is otherwise so lavishly illustrated. Sendak employs minimalism to expansive effect: the unadorned narrative allows the imagination to roam, enabling the reader to take only what s/he wants from the story. Yet a literal reading thereof – such as may be absorbed by younger readers – is no less compelling in terms of tension and atmospherics, than one more interpretive. It is not surprising, then, that long before a film came to fruition, the book was successfully transferred to such artforms as opera and ballet. Both can construct lengthily sustained narrative interludes out of individual emotional beats through accumulation of music and movement, in much the same way as Sendak abandons verbal storytelling altogether when he reaches the “wild rumpus” that forms his book’s climax, using unaccompanied illustrations to convey the cathartic nature of intensified action. As a medium, mainstream cinema doesn’t normally permit that kind of rhythmic languor, though it definitely shares Sendak’s emphasis on economy. The literary structure here is distinctly at odds with the rapidly consecutive story beats of studio filmmaking, not least within the realm of children’s film, so it’s fitting that it has fallen to an iconoclast like Jonze to refashion it for the screen. He’s a canny choice to preserve the dusky palette and oddball perspective of Sendak’s work, while nudging the narrative toward more intricate territory. One of the most common misgivings doing the rounds about the project is that Sendak’s book has “not enough story” for a successful feature film, a surface-level judgment derived more from word count than a close reading of the material. “Where the Wild Things Are” may be comparatively low on incident, but the “story” is substantial and, beneath its formal idiosyncrasies, rooted in a rich tradition of children’s storytelling. 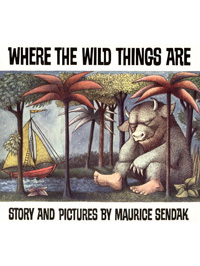 The moral of Sendak’s story, however, is perhaps more complex – though his iconic final line, “And it was still hot,” is an essential rewrite of “There’s no place like home.” The reason for both the book’s durability and its universality is that it’s a coming-of-age tale with some rather hard psychological truths, in which our protagonist, Max, learns how to channel negative emotion internally, creating a fantasy outlet for his darker impulses. Jonze and his co-writer Dave Eggers should be able to productively build upon this theme, forming as it does an unexpected thread of continuity between “Where the Wild Things Are” and Jonze’s own features “Being John Malkovich” and “Adaptation” – all are, to some extent, explorations of the subconscious. But if Sendak’s narrative provides clear pointers for screen embellishment, the issue of characterization requires more initiative on the screenwriters’ part. While drawn in the quickest of strokes, Max may be a relatable, fully-formed protagonist, requiring the presence of a charismatic, unprecious child actor, but he’s also the only character to speak of in the book. His exasperated mother remains an invisible presence; the titular “wild things” are an unnamed collective demonstrating a shifting but unanimous reaction to Max’s presence. It is here where Jonze and Eggers are riffing most adventurously off Sendak’s text, crafting an on-screen character for Max’s mother (Catherine Keener), and inventing a whole new one in the shape of her boyfriend (Mark Ruffalo). This is clearly designed to serve Max’s characterisation by enriching his backstory and providing a clearer catalyst for his frustration. The emphasis on single parenting is a nice contemporary angle to take, and could offer an actress as empathetic as Keener some interesting notes to play, though the adults should, I think, remain a background presence. A more essential modification is the creation of distinct personalities and voices for the creatures of Max’s imagination; the resulting relationships should help cinematically sustain the narrative where Sendak relies on more impressionistic techniques. With such changes, Jonze and Eggers do run the risk of normalizing the heady child’s-eye perspective that makes “Where the Wild Things Are” so disquieting and, ultimately, haunting, but short of steering the film into intensely avant-garde territory – a move that might delight some purists, but would betray Sendak’s intended audience – it’s difficult to see what other options the book presents. However the film turns out, and whatever audience it ends up finding (and I have a hunch that it won’t include Academy members, which would be no bad thing), we should be excited that this defiantly strange and special book has landed in the hands of a filmmaker no less eccentric. Wonderful article, Guy. The film can’t come soon enough. It’s been far too long since we’ve seen anything from Spike Jonze. I still seriously doubt this is Oscar bait. And I mean that in the best possible way. Maybe they can give Original Song to Arcade Fire for the beautiful, prominent use of “Wake Up” in the trailer (kidding, of course). Can’t wait for this movie. While I’m sure much of the success of the trailer was due to editing magic, I have a feeling that this is gonna be one to watch out for this fall. The FX slate is gonna be pretty heavy this year, as well as sound and sound editing, but something tells me that, should this live up to the expectations set by the trailer, we may see this slide into some big categories (no pun intended). The again I had the same feelings last year for “The Wrestler,” and it didn’t snag the BP nod I thought it would. So we’ll see.